N.B. The cottage is available for holiday use only. It is not for contractors use. We have decided to update our photos as many of our guests have advised that they do not do justice to the cottage. For 2018/2019 photos please do not hesitate to ask. We have for the last 7 years let this holiday cottage and after renting an Owners Direct apartment ourselves we signed up with O.D. Our aim is to provide you with information to help you decide that the cottage is right for you. Previous guests have advised us of their stay and many have returned. The holiday cottage which is pet free and no smoking status is a semi detached 300 year old grade 2 listed building set up from the road ( See Below) with its own access through landscaped gardens to include a very unique BBQ area with seating. Apart from the cottage next door(owners) there are no immediate neighbours. We are on hand for any issues including advice on local places to visit but we leave you alone to get on with your holiday time. There is an uninterrupted view of the Wrekin Hill and the cottage has fields to the rear and side. Old with oak beams but with all modern amenities. The downstairs bathroom has a modern powerful shower (Separate cubicle) and a cast iron roll top bath. Upstairs in the large bedroom there is a modern basin. Double glazed and centrally heated throughout meaning a cosy place to come 'home' to in the cooler months and well insulated to be cool inside when the weather outside is warm. There is a log burning stove for those extreme cool conditions. The cottage was part of the owner's property but when the children fled the cottage was separated and is now back to the original set up being 2 cottages. The furnishings are a mix of modern and antique. Upstairs is fully carpeted and downstairs the modern kitchen and living room has top quality travertine floor tiling. The price includes all towels linen and logs. Plenty of kitchen utensils and supplies. You will not need to bring kitchen items as it will all be provided. A minimum of tea coffee and milk provided and for those guests staying a week we add bread butter and eggs. During peak summer time we have a minimum of 7 days stay starting Saturdays. Please note that the property is situated back from an A road. It is not a trunk road but can be busy at peak times. More information is available if needed. There are steps to the cottage. Not mountainous but steps all the same. For guests with walking difficulties a level entrance can be provided. Its old world charm with modern facilities. Very cosy in the winter and airy in the summer. Some unique features to include a BBQ area like no other. This cottage has been available since 2011 and we used mainly our own website. Owners Direct only since October 2016 and we are confident that guests from OD will enjoy the property as our many prior guests have commented upon. It is downstairs. It is of a Victorian style. There is a cast iron roll top bath and a good pressure separate shower cubicle. My wife likes it and uses the bath when we have no guests. Free Wi-Fi but downloading not recommended. Small device. It is plenty! instructions available. Pod type available.no mess. In the kitchen. Enough for 6. Secure area provided for overnight storage for guests bicycles. If during your stay your require a change of bed linen additional to changeover days a charge of £10 is made. For towels it is £5. A basket of logs and kindling is provided. Additional supplies a charge if £5 will be made. We do try to make your stay as pleasant and comfortable as possible and we are on hand to help with any enquiries or assistance within the realms of a self catering holiday. cosy cottage. Perfect for us. Lovely long weekend. Well equipped, cosy and warm. We were looking for a cozy retreat with a real fire. We certainly found it at Folly cottage. The property had lots of attention to detail - from practical things like kitchen equipment to beautiful cushions and decoration. We made full use of the wood burning fire (even though with the central heating it wasn't essential!!) It was a true get away from it all. I'm sure it will be just as beautiful in the summer. Will be recommending to friends and family and hope to return. Thank you Louise And Jon for your kind comments and a special thanks for leaving the cottage so spick and span. We would love to see you again and hope we do. Thank you Michael and Rachel you are amazing hosts. Thank you so much! 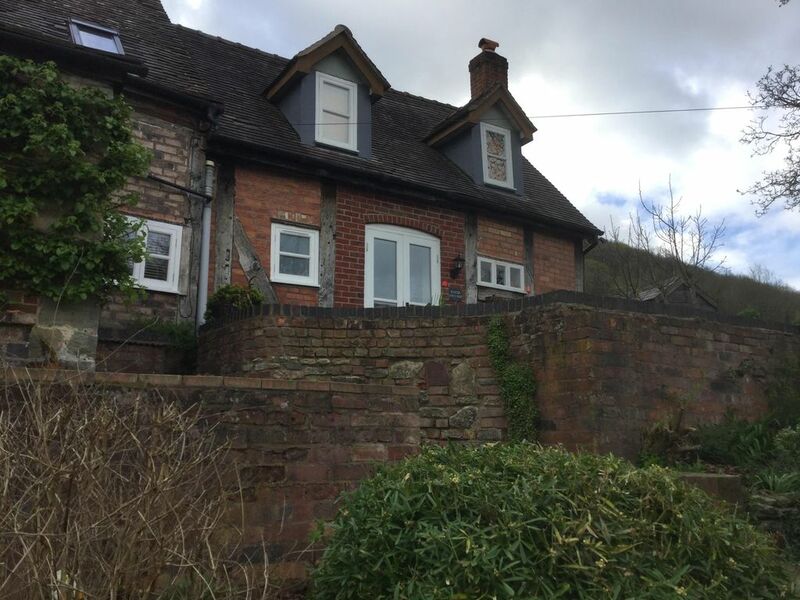 We spent a relaxing week based at this beautiful cottage situated near to Ironbridge where there are plenty of historic sites and stunning walks on your doorstep. The cottage was tastefully decorated and all mod cons provided with a lovely outside area for sitting out and having a barbecue. Thank you for making our stay so comfortable. My sister and I stayed at the cottage for 4 nights in May 2018 and enjoyed it very much. It is a lovely cottage that was very homely and cosy. We stayed in May but still enjoyed a fire on two nights as we just love having fires. Mike and Rachel were very welcoming and always there to give us some local knowledge. The reason that I am giving the review 4 stars and not 5 stars, is due to the main A road at the bottom of the drive. We found that we woke up some mornings quiet early due to the noise from the road. Apart from the main road it is the perfect cottage, it even has two friendly cats who pop in to say "hi" from time to time. Thanks for your fair comments.. plans in place to alleviate the road issue which is noticeable in the front bedroom. Erection of a sound deadening barrier we are told will be effective. More than enough space for four adults, nice grounds which we used well as the weather was so good. Good location for visiting Ironbridge and surrounding attractions. Hosts very friendly.